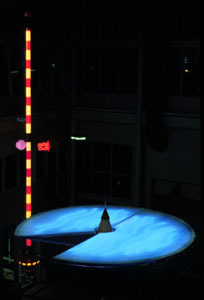 "The Flibbertigibbets Meet The Newtonian Proxies"
Underview of the Empirical Plumb and the Auroral Cone. 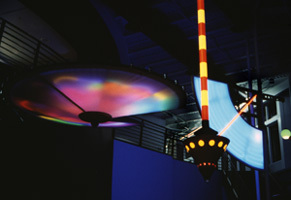 The Auroral Cone is light animated recreating the moving Aurora Borealis. 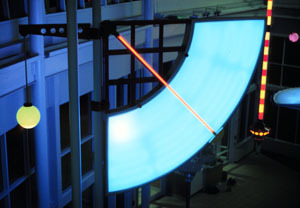 The Equatorial Newtonian Proxy as viewed from the skyway entrance to the Omni Theater. 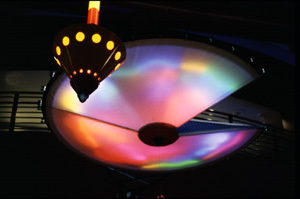 Activity: Aurora Cone; Flow Animated Neon Tubing, modulating color fields. 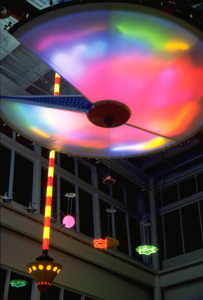 Kinetic illuminated flying objects (the Flibbertigibbets) suspended from cables running across the space.